A mid 19th century creation of the Raj, Darjeeling is the most popular and perhaps the most spectacular hill resort of India. Located on the footsteps of the Himalayas and perched on the roof of the world, it is surrounded by snow capped mountains and dense forests. 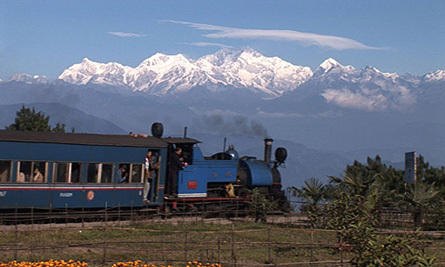 Rich in flora and fauna surrounding the countryside Darjeeling lives in the shadow of the majestic Kanchenjunga. The small town is a maze of steps and terraces and a treat for nature lovers. 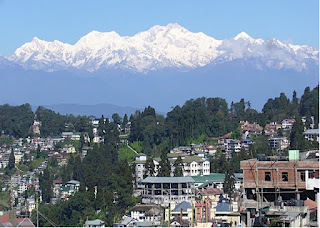 Over 4,000 species of flowers, 600 species of birds and many animals and reptiles are found in Darjeeling. Ruled by the kings of Sikkim, Darjeeling was Dorje Ling, meaning Place of Thunderbolt in the local language, before being discovered by two British Officers. The place then full of forests was appreciated by the two British officers as a place of strategic importance bordering the three neighboring countries. The king of Sikkim was pressurized to give the place on rent to the British who began rapid development of the small village turning it into a beautiful hill resort. Darjeeling conjures visions of serenity, of vibrant green hills steeped in splendor, a land of breathtaking beauty crowned by the majestic Himalayas.Reaching Darjeeling from Kolkata was a big effort which resulted in construction of the highest railway line in India. The Toy Train, a miniature railway which runs till date was started in 1881. A ride in the toy train is a joy ride with train gaining the maximum speed of 10 km per hour with giving ample time to appreciate the nature's glory around on the way. This heavenly retreat is bathed in hues of every shade. 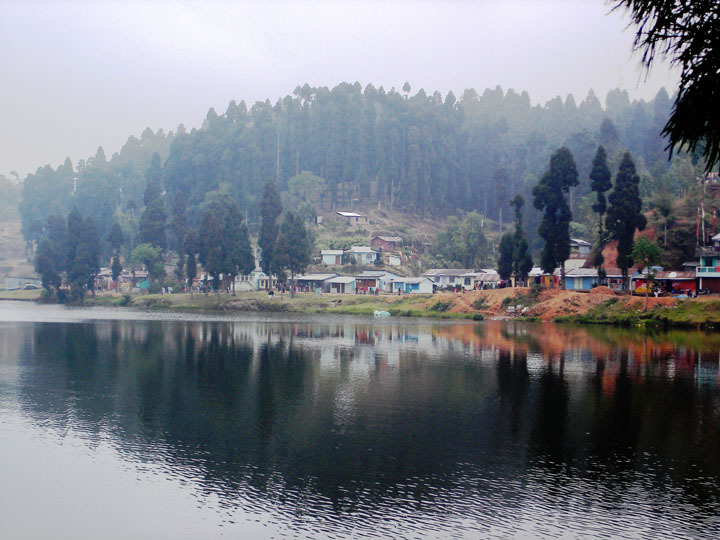 The visitors to Darjeeling are welcomed by the cool climate, variation of greenery of dense pine forests, mountain meadows and large tea estates. To top them all are the smiling people showing the diversity of cultures present in this small place. There are Bengalis, the Gorkhas from Nepal, the Sikkimese, the Lepchas and the Bhutias and the great mountaineering Sherpas. Mountaineering and trekking activities are in full swing during the year from Darjeeling. The flaming red rhododendrons, the sparkling white magnolias, the miles of undulating hillsides covered with emerald green tea bushes, the exotic forests of silver fir - all under the blanket of a brilliant azure sky dappled with specks of clouds, compellingly confounds Darjeeling as the Queen of Hill stations.The enchanting nature at its full bloom, the enthralling views of the Himalayas, the captivating sight of the cultural diversity and the charming people, all make Darjeeling an exceptional tourist destination. Location: At the height of 7,000 feet above sea level, in the north of West Bengal, on the footstep of the Himalayas, nestles this small town of Darjeeling. Around 680 km away from the capital of the state Kolkata, Darjeeling shares its borders with all the three neighbouring countries. Nepal is on the west, Bhutan in the north east and Bangladesh is in the south east of Darjeeling. A small portion of Uttar Dinajpur and the neighbouring state of Bihar touches its southern tip. 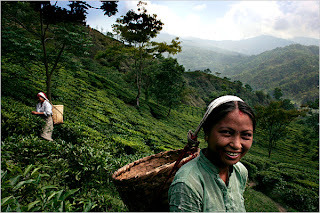 It produces the finest tea in the world with tea industry being the main industry. With 86 tea gardens it produces 25% of the tea output of India. Ghoom is the last town on the Indo-Nepal frontier in West Bengal and the highest railroad station in the world standing at an altitude of 2,257 meters. Easily approachable Ghoom is the home of a Tibetan Buddhist monastery founded in 1875 by Lama Sherab Gyantso for the Yellow Sect of Buddhists. The monastery has a 4.8 meter tall statue of the Maitreya Buddha and also contains images of Buddha''s disciples, Chenrezi and Chongapa. The Buddhist Tibetan gospel, Kangyur, has been preserved here in all its 108 volumes. This monastery is famous for its Tibetan New Year celebrations during February-March, when the monks fly prayer flags in Tibetan tradition and hold religious and folk dances. The Ghoom Rock, offering a magnificent view is the most popular tourist spot. Located at 7 km from Darjeeling, at an altitude of 2610 meters, the Tiger Hill offers a magnificent view of the great Mount Kanchenjunga and the other peaks of the Himalayan range including the Mount Everest. A steep gradient road through colourful forests of oak, magnolia and beautiful ferns runs up to the Tiger Hill. To ensure a treasured sight one has to reach this point early at dawn before Sun rise. The spot is superbly developed to give a 360 degree view of the Himalayas. 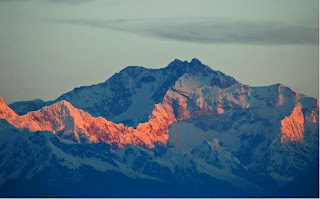 As the Sun rises over the Kanchenjunga one sees the five snow-capped peaks glow in the magic of crimson, pink and shining gold light. If the weather is clear even the great Mount Everest is Visible with Tibet's Chomol Hari Mountain, the most beautiful peak in the world and the Kabru and Janu, peaks which are though visible, actually are dwarfed by the magnificence of the Kanchenjunga, which leaps into view. The Kanchenjunga, at 8,586 m., is the world's third highest peak, and a formidable peak for mountaineers as the climb is considered more hazardous than the Everest. 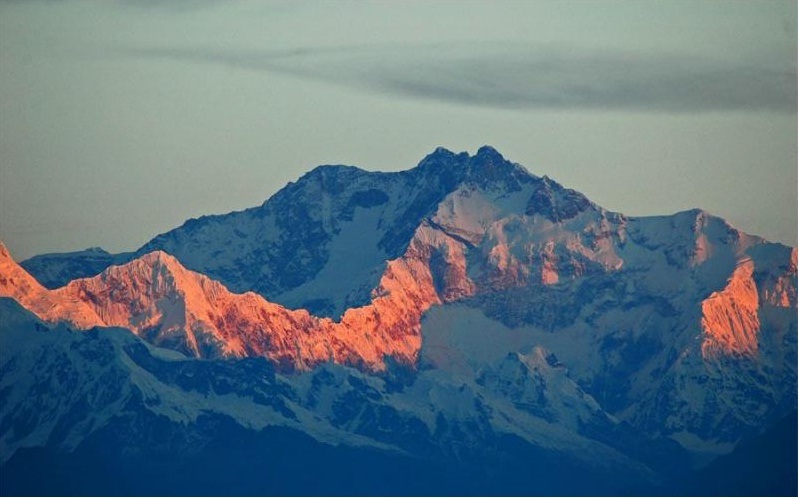 The Kanchenjunga Range derives its name from the Tibetan word, Khang-Chen-Dzod-Nga, meaning Five Treasures in the Snow, a reference to the five snow-capped peaks of this towering mountain range which can be viewed from the Tiger Hill. Although the Kanchenjunga is seen off and on from various places in Darjeeling, the sunrise view from the Tiger Hill takes the cake. The ancient locomotive that comes chugging from Siliguri for Darjeeling is the attraction for young and old alike. This miniature railway engine, popularly known as the Toy train, has been doing the rounds from Siliguri to Darjeeling since 1881 and has been included in the world heritage site. It takes six to seven hours to cover a distance of 82 km and with a speed of 10 km per hour it offers a relaxed view to appreciate the abundance of nature on the hills of Darjeeling. Driven by a chugging stream locomotive, the train moves on a narrow, two feet gauge track, passing through the forests, waterfalls, deep valleys and through tunnels to reach Darjeeling. The idea of this train was conceived in 1870 in order to reduce transit costs and it started operating in 1881. Soon the landscape changes to reveal tea plantations that cling to the steep mountainside, and form narrow terraces that look like giant steps. The Kanchenjunga appears out of the mist like magic little later. Moving through the many tea gardens, the train reaches Ghoom, the last town on the Indo-Nepal frontier and the highest rail station in the world, situated at 2,257 meters. After Ghoom, the train starts descending towards Darjeeling for 6 km and passes through the Batasia Loop. The Batasia Loop is an engineering marvel where the railway line negotiates a graceful circle and descends 1000 feet almost imperceptibly. Whether riding aboard the Toy Train, or just watching it navigate the loop, the Batasia Loop is a memorable experience. 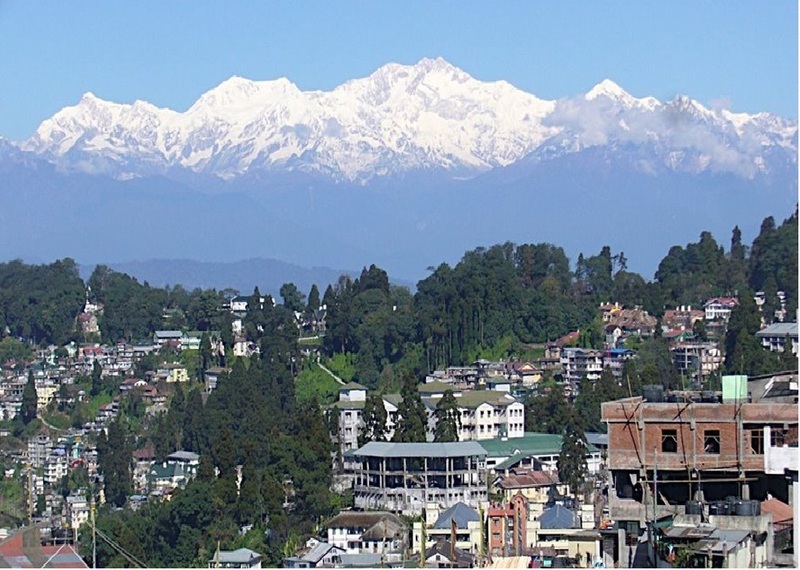 Batasia means Windy Place which offers a grand view of the town of Darjeeling, with the magnificent Kanchenjunga in the background. Sir Ashley started the Lloyd Botanical Garden to study living specimens from the sub-temperate and temperate Himalayas in 1878 over the 40 acres land donated by Sir Lloyd. Over the years, exotic plants from other parts of the world have also been included turning them into the best gardens of Asia.The garden has charmingly laid-out terraces containing alpine plants, arum lilies, geraniums, azaleas, tree ferns and conifers. There are plant species from Europe, Japan, China, Africa, America, and also from Australia and New Zealand The Orchidarium houses 2,500 plants, including over 50 rare varieties. The cacti and succulents are housed in a separate conservatory, with 150 species on display. The medicinal garden contains indigenous medicinal plants of the Eastern Himalayas. A flower show is held annually during the summer months. The erstwhile summerhouse of Maharaja of Nazargunj is now redesigned in the colonial style as modern resort located just opposite the Governor House. This westward facing resort offers warmth of sunlight to guests throughout the day. Surrounded by fir and pine trees & flowers of different colours, shapes sizes and fragrances, Mayfair Hill Resort nestles at the foot of a hill and overlooks several others.. A stay in this resort is a haven from the maddening crowds. One of the best hotels in Darjeeling. 50 beautifully appointed rooms & facing the Kanchanjanga.Darjeeling (2134 metres above sea level) is a superlative combination of fern-filled valleys, snow-capped peaks and tea-scented air. A blue toy train on the world's highest railway track chugs through an emerald carpet of tea gardens, passing through a series of dizzying waterfalls and hairpin bends. The Windamere Hotel-situated on the Mall, Darjeeling's beautiful scenic walk, and overlooking the Chowrasta, the town's famous promenade. Hotel has 21 rooms with 5 attic rooms, 6 luxurious double rooms, 10 cottages. A luxury hotel in Darjeeling, India ,Viceroy needs no introduction. Stepping into the warm settings of the hotel,you will immediately feel yourself sucked into the lap of contemporary, understated luxury. It is the best hotel in Darjeeling where you can pamper yourself with the ultimate luxury. The details are in impeccable from its world class service and cuisine to an unrivalled fusion of business services and modern luxuries, from the displays of fine art work to the highly stylized uniforms worn by the staff. The Viceroy is in every sense a fashionable deluxe hotel in Darjeeling and is graded as the best hotel in Darjeeling.